Randy the Rhino Has a Terrible Day | Words. On the Internet. 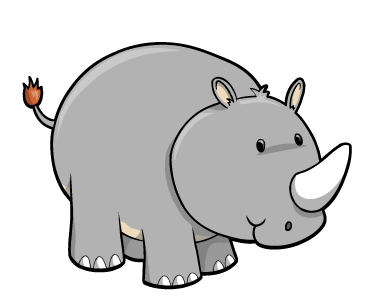 Randy the Rhino rose from his bed and looked out at the day. It seemed it was Monday and that wasn’t okay! He couldn’t stay home and play as he chose, he was needed at work with his big, pointy nose. He grunted and moaned and cried in dismay, did all that he could to push the weekday away. Yet as hard as he tried, despite all that he did, the sun shining outside didn’t bat an eyelid. He sighed to himself, now accepting his fate, but cried one last time: who had changed the day’s date? It was Sunday as the night had last come to a close, he was sure of it even as he started to doze. Yet deep down inside he knew not to debate, ignoring his work would be quite the wrong fate. Randy put on his favorite blue shorts and his favorite red shirt, then enjoyed a quick breakfast of yummy yogurt! Although it was Monday, he now felt more alert, and stepped outside with his big smile overt. The sun was still shining and the air was quite warm, Randy’s neighbor Charlie was out mowing the lawn. He waved a hello, to which Randy waved back; perhaps it was time to cut Monday some slack. Randy the Rhino walked to the concrete, enjoying the air as he came to the street. He looked both directions, eyes not missing a beat, and then ventured across on his little gray feet. He hopped up the curb and continued his way, passing by friends he saw every day. There was Gina the Gerbil and Larry the Lark, Timmy the Turtle and Sammy the Shark. And oh, who is this? Who could it be? It was Mary the Monkey and Billy the Bee! He smiled and waved as they passed his way, their faces both blank and distinctly afraid. They looked so skinny, so scared and alone, an empty bag hanging from Billy’s arm bone. The two of them stared, eyes frozen like stone: blood-red and bare like their soul’s weren’t home. Randy laughed gleefully at their silly display and continued walking on his cheerful way. Perhaps Monday was not the worst day! Randy the Rhino passed by all sorts of things: From buildings and parks to plain, empty swings. He passed by crowds and houses and zoos, until he came to an alley of strange dangling shoes. They hung on a wire high up in the sky, as if someone had tried to see if they’d fly! He smiled and laughed, how silly they were. Shoes were for feet, not for way above doors! He fell to the floor and continued laughing, but stopped when he saw four feet come thrashing. They were charging his way, running with purpose; two blurs that seemed to think life worthless. Randy rolled over to face the commotion, squinting his eyes as he set into motion. Who was that running? Who could it be? It was Mary the Monkey and Billy the Bee! Randy the Rhino smiled with glee—his friends were here to see what he’d seen. The two kept on running faster and faster, charging straight for him – this could be a disaster! He tried to stand up, to move far away, but his actions came just a mere second too late. Mary the Monkey and Billy the Bee came crashing down before he could flee. They covered his mouth, and as Randy cowered, he quickly discovered he was quite overpowered! Billy then turned and presented his stinger, plunging it deep into Randy’s poor finger. He screamed as he felt it exit his hand, his bone snapping off as if on command. Mary laughed as he shuttered in pain, then shoved her fist almost into his brain. He screamed out for help, but nobody came, as she repeated the process again and again. He begged her to stop; he was crying and pleading, every part of him was now badly bleeding. Billy the Bee looked down with some pity, then smiled and beat him half into the city. Mary hit next, her fists smashing a ditty, and laughed in his face as his blood became gritty. They giggled and cheered, fists flying like rockets, until Randy’s eyes remained still in their sockets. Together they knelt and grabbed at his pockets, digging to see if he even carried a wallet! He didn’t, it seemed, but that was okay: his big, pointy nose would surely save their day. With knives and hatchets they carved quickly away, until what was his now belonged to just they. The two then stood up and went on their way, bag dripping red like a spilled Cabernet. To them it had seemed a rather successful day: For far meth this horn would pay! Writing Prompt: Write a children’s story that turns incredibly dark.